Housepets! - View topic - Halloween Costumes? speaking of costume, well,I don't know, I really don't know!! tho I'm planning to stick these around the school that I go to. I should totally make those. 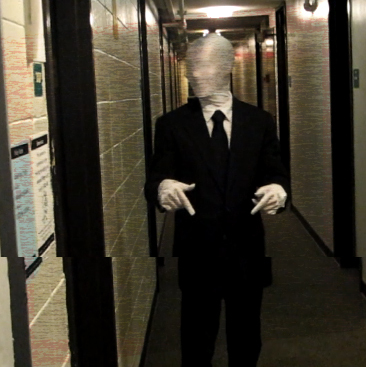 I'm going to dress up as the Slender Man again this year. Maybe this time I'll get some drywaller's stilts and make the costume really creepy. Then get one of my friends to dress up as Masky and creep around with me, drawing Operator symbols on everything. Last year I went around dressed as Robin Hood, and my friend has been a werewolf for the past 3 years. I'm thinking of getting a Wizard costume this year! There's no trick 'r treating done in my home town, and all the parties are for little kids. Your Masky friend should also just sit on porches, completely still, waiting for trick-or-treaters. When they approach, he should run at them and tackle them. That's the true holiday spirit! Me and my friend are trying to find a wheelchair at a medical supply store or something so I can wheel him around in a batman costume dressed as the late great machoman randy savage. I'm not sure how we came up with that idea but apparently that's the plan. This year I don't have to work on Halloween, so I am going to the costume parade they throw at the mall every year. My friends have fur suits and they will be there. I have a gas mask I think I am going to wear. I am not much on elaborate costumes. Problem is that I'm only gonna be out during the day so I will appear human. I forgot to mention that those are really freaking awesome. I will proudly be walking around Winthrop as Slender Man. Is that tearing part of the costume? Tearing? What do you mean? "Got a selection of good things on sale, stranger!" ...you wanna buy a watch?? Just be careful who sees you opening your trenchcoat for small children. One year I will be lazy and just wear a green sweater with giant gray pants because I look a bit like Trip. Nobody would understand and my self esteem would suffer. just carry a picture of Italy and ask people what it says to them. I've been invited to be the official mascot for the dog "trick or treat" fundraiser event this next Saturday. It's a big fundraiser to raise money to support the therapy dog / leader dog program in our area. I'll be on-site for the day, me and my boy, doing dog tricks. It'll be a treat! Work is actually doing a zombie theme - bring old clothes and someone will do makeup to make everyone look like zombies! Personally tempted to put on my samurai outfit though - I have a hakama and everything (and can actually fit into it properly this year)! I have decided that I am going to wear the gas mask with a dark colored rain coat or smock. I am going to write in Russian on the back "Chernobyl Power Station". Topped off with a pair of gloves, I am going as a zombie/mutant from the Chernobyl Exclusion Zone". I am going to be apart of the costume parade at the local mall. Some of my friends will be their, some in fur suits! I am going to hand out old comic books to the kids. Halloween trick or treat went really well. We ended up on the front page of the Sunday community section of the newspaper in full-color! I have a couple more stops coming up this week. One at my church on Saturday, and one or two stops on campus at Michigan State on the 31st. Your costume is much more detailed I think. Are you kidding? That's the best human disguise I have ever seen. So after waiting until the last minute I threw this together real quick and on the cheap. File comment: Can't match my retro swag. No prob it's what I do. What are you, a sparkledog? what color leg warmers is he wearing?